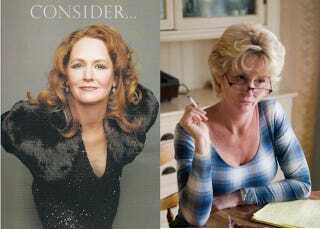 If you've seen The Fighter, you know that Melissa Leo's chainsmoking, white-jeaned matriarch vies with Christian Bale for stealing every scene. But when it comes to the Oscars, turns out Leo has to do even more heavy lifting. She explained the ads followed months of her frustration at not being able to land magazine covers, even with all the awards and attention for The Fighter. Leo is 50 years old and she attributes the media's lack of interest to ageism and because of that and other factors she's not considered "box office". "I took matters into my own hands. I knew what I was doing and told my representation how earnest I was about this idea. I had never heard of any actor taking out an ad as themselves and I wanted to give it a shot," Melissa told me. ..."I did hear a lot of very positive comments, particularly from women of a certain age who happen to act for a living and happen to understand full well the great dilemma and mystery of getting a cover of a magazine." She runs the risk of a backlash — in fact, Leo is already thought to be a frontrunner in the category — but in any case, there's some self-promotion we can get behind.